When it comes to cats, their normal body shape will depend on the breed. A Siamese or Oriental cat tends to be slender while other breeds, like the British Shorthair, is naturally rounder. Here are some examples of typical cat weights depending on breed. Of course this can vary between individuals – cats differ in size just like humans do. You should be able to feel the ribs and underlying skeleton on the cat, but it should also have a thin layer of fat under the skin, and muscles on the shoulders and legs. An underweight cat looks bony with a thin waist. The overweight cat may have a wiggly tummy and lack waist. 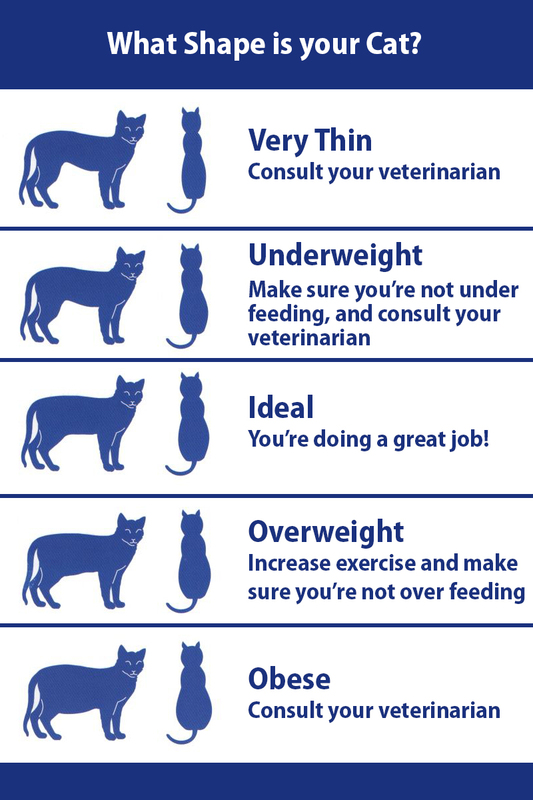 Weight gain and loss can depend on other factors than just the food, so it’s a good idea to consult your veterinarian if your kitty is becoming chubbier or thinner. A veterinarian can help rule out diseases and give advice on feeding amounts and types of food. Below is the average weight range for some common cat breeds. Of course, regardless of your cat’s shape, we can help you find the best cat door for your needs.